This month's blogs of the round table topic concerns our relationship to natural environments in games. Among other questions posed, one of the discussion prompts asks us to identify the most convincing natural environment we have encountered in a game. What does it mean for a natural environment to be convincing? There's the visual component, of course, but I'm not especially concerned with that. For me, a convincing portrayal of nature is one that encapsulates some kernel of truth about the properties of natural systems, and ideally allows me to explore an authentic aspect of my own relationship with nature via the dynamic behavior that emerges from my interactions. I think of the tranquility I felt while flying across the simple landscapes of Pilotwings 64 in the bird suit, without any artificial objectives dragging me back down to earth. I think of scaling that first cliff in Knytt, hearing the pitter patter of my character's tiny feet scampering up the rock face only to be greeted by vast, misty mountains in the distance; how the sheer scale of the landscape unfurled before me served as daunting evidence of my own insignificance, but also as an irresistible call to explore and discover. 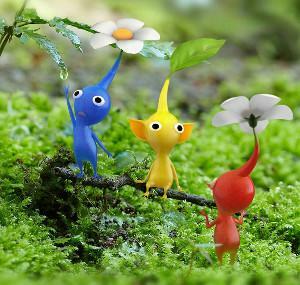 I think of the fragility of my poor little Pikmin recruits, how my entire initial flock drowned in an inch deep puddle before I could figure out how to rescue them. I can still remember the shock of seeing their little souls float away, dissipating almost instantaneously - the final tokens of a grueling, ephemeral existence. Mortality caught up to them with pitiless efficiency, and the brevity with which their passing was marked betrayed no undue sentiment. After all, it is only the natural way. I think of the many times I've scratched and clawed simply to eke out a meager subsistence, figuring out how to stay alive within harsh ecosystems that were altogether indifferent to my continued survival. That desperate will to survive in spite of adversity is of course a common theme across all media - and a pervasive motif in everything from Meek's Cutoff to Hatchet to a thousand other stories - but it's especially harrowing when you're tasked with not only inhabiting that space mentally, but also operating directly within it and taking charge of each pivotal decision. Every perilous scenario becomes imbued with a heightened sense of personal responsibility that makes you grit your teeth just a little more as you ford the river, or guide your herd of lemmings past lethal pitfalls, or simply try not to starve. In our rush to categorize, dissect and quantify games in order to better understand them, we occasionally lose sight of some of the most basic pleasures that our work can provide. Sometimes it is enough to place players inside an environment that is interesting, evocative, mysterious, or bewildering and let them wander through it without the signpost of an explicit goal to mark their progress. There is value in that ambiguity. It leaves enough space for players to define their own implicit goals, or abandon these same aspirations on a whim in favor of basking in the sensory pleasures of their surroundings. There is a natural beauty to be found in the joy of discovering unfamiliar territory. We gain an inherent sense of accomplishment simply from grasping on to the triumphant, fleeting moments of lucidity we encounter amid life's chaotic swirl. Even in the teeming wild, there are footholds for us to uncover. Is it still a game without a prescribed goal? Does it become merely a setting? A notgame? A videodream? Once in a while, it's beneficial to take a breather from such anxiety-laden ruminations and step outside for a barefoot stroll through the grass. You'll encounter plenty of constraints out there in the field, and a whole bundle of instinctual drives that help to propel nature's components and perpetuate its systems, but I'll wager you won't find a singular, overarching goal or universal win condition (if you do, be sure to let me know!). So the next time you find yourself stagnating in your creative process, repeating the same old tropes and patterns in pious adherence to the supposed principles of game design, try taking a cue from the wilderness. Give players the keys to your world and turn them loose to explore it. Create a context with just enough constraint, simulation and systemic interplay to allow them to find their own memorable moments. Dispense with the rigid guardrails, gregarious tour guides, and the rest of the unnatural restrictions we impose on players like overprotective parents as we studiously fulfill our presumed duty to always provide a consistent, predictable experience. Accepted game design wisdom will always have its place. By all means, continue to test and refine, iterate and evolve. Gather ye metrics while ye may. This is one viable, well-worn path to creating a fun product. But if you feel yourself pining to craft a different sort of experience, one where new meanings can arise organically without reliance on tallying up victory points, be mindful of the power of nature.